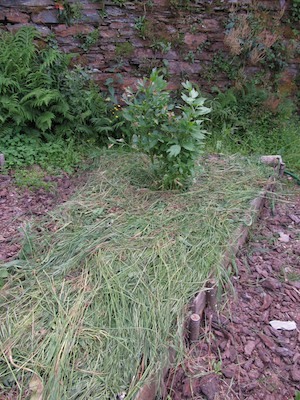 I thought the hay/straw mulch I used in the raised beds last year was just brilliant. 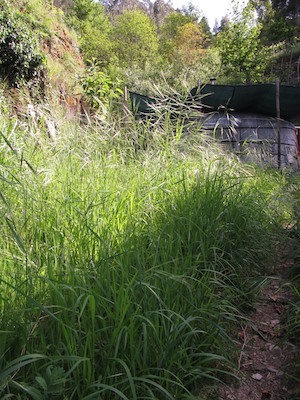 It dramatically slowed water loss from the soil – summer watering was cut from a daily ritual to a weekly one – and it suppressed an enormous amount of weed growth. So this year, as the area under cultivation has spread, so (thanks to 12 bales I managed to secure at the back end of last year) has the straw. But straw is less than an ideal solution here. For starters, it’s an external input so it’s breaking the feedback loop we aim to establish here to ensure we can build and maintain our soil health and fertility naturally onsite. It costs money … which has increased to around €4,50 a bale this year with the drought through the winter and spring. It introduces seeds of plants which weren’t previously growing here and which we didn’t choose to plant (which can be both a plus and a minus). But perhaps most significantly for the health of the land and ourselves, I don’t know where it’s come from and hence what herbicide and pesticide residues might remain in it. But compromise between the ideal situation and what’s practicable and realistic in the circumstances is inevitable, especially at the start of a project. Worrying about being totally purist is pointless when the environment is an open system (as many organic farmers are finding as drifts of GM pollen blow across their land …) and concern about chemical residues when I’m surrounded by folk glyphosating the hell out of their quintas might seem slightly academic. Is that a poor excuse for watering down principles? You could read it that way if you want, I guess, but to me it’s more about pragmatic and realistic acceptance of the present environment we’re living and working within. I choose not to grow that way and do what I can to keep the stuff off the land and create a clear demonstration that it’s neither necessary nor in any way advantageous. But I also accept that some contamination is going to be unavoidable and that minimal and occasional concessions can be acceptable when the alternative is too costly; either financially, in time and effort, or in stress levels and stomach ulcers. 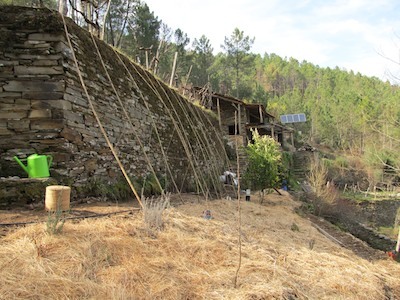 The straw (mostly oat) was there when required – in the depths of winter, baled and ready – to provide protection from the elements for the newly cleared and turned soil of the new raised beds and cultivation terraces. The alternative would have been to cut dead bracken for the job, but being as the areas of dead bracken are also full of gorse and brambles, it’s a major undertaking to harvest and separate if I don’t want to be continually spiking my fingers every time I work in the beds. Which I don’t. Gorse spikes are the worst. Now we have these cultivation areas established however, there’s no need for further external input when we can grow our own. And grow it does! 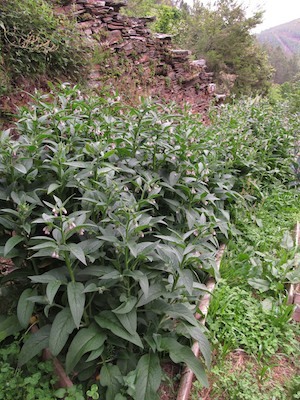 The recent rains have produced an explosion of growth all over the quinta. It happens every year in Spring and still I’m amazed by the extent to which the entire quinta is transformed into a jungle over the space of a couple of weeks. I wasn’t planning to do anything with it for a while yet as there’s little point in cutting it all until the rains have finished as we’d only have to do it all over again a couple of weeks later. Also, when it’s still green and growing it helps retain significant amounts of moisture in the soil and the longer you can hold moisture in the soil through a Portuguese summer, the better. 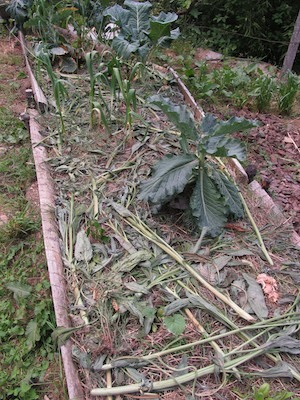 But I had to cut the comfrey. It has grown so enormous so quickly that things interplanted with it – peas and onions – have been completely overwhelmed and shaded out. 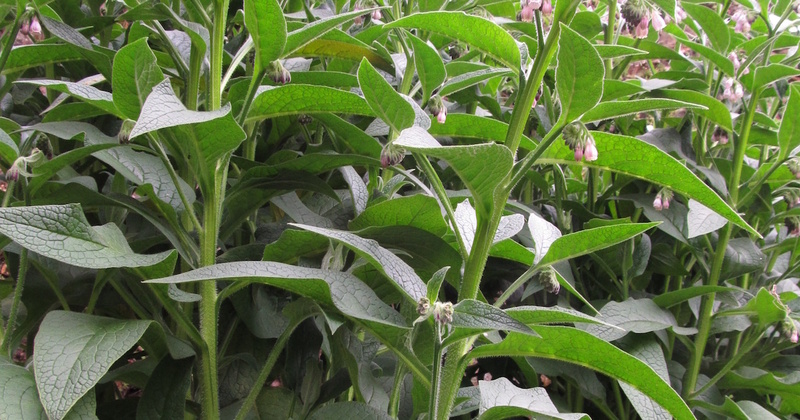 I put a large binful of comfrey liquid manure on to brew and still there was loads of it. So I put the rest on the beds. After allowing the comfrey to wilt a while in the sun, I then cut a load of the surrounding vegetation (mostly grass) and laid that on top. Mega mulch! It’s now about 15cm (6″) deep. Though it will settle and lose volume as it dries, I’m expecting it will perform even better than the straw did on its own. The trick in future will be to either time our land clearing and mulching to coincide with availability of vegetation for mulch, or to cut, dry and store mulch material when it’s available for later use. Storage depends on having storage space, so for the foreseeable future – at least until other building works are complete – it’s going to have to be the former.